Hello Clothes Club gang, we hope you’re having a good 2019? We’ve been busy planning our next event, with Amnesty International. It will hopefully be in May. Our first ambassador did their event last November. They raised a brilliant £350 for a mental health charity. We’d like to now scale doing these across the UK. And we’d love to build our clothes swapping app, think Tinder for things! Do you have unwanted items in your wardrobe? Perhaps a dress your wore to a wedding once. Or something that doesn’t fit anymore. Would you like to use our app to find people you could swap it with? You’d offer your dress and they might offer a coat, scarf, jumper etc. You’d get multiple offers (hopefully) and swipe for the one you want to swap it with. If you’d like to join us for an early beta test, before everyone else, pls sign up here. Money raised is helping Birdsong, an ethical fashion brand who work with different female makers. One group is Heba in Tower Hamlets who give migrant women a safe place to learn sewing skills. In order to get entered into the raffle you just need to RT the message using #theclothesclub. If your name gets drawn in the raffle you need to attend or have a friend who can attend on the evening, so you can take the bike home. The competition is only open to people living in the UK and having someone available to attend on the evening details are here. Otherwise the next name will get drawn. There are multiple prizes in the raffle so your name might get drawn for something else. We’re doing our next event on Dalston rooftop this Wednesday 17th August. We’ve done a summer pop up the last few years with Dalston roofpark and have stalls run by TRAID, Art Against Knives present IN OUR HANDS pop up nail bar, Soap Co and special up-cycled garms by Manni. Arrive from 6.30pm with your clothes and we’ll be sorting them out until 8pm when the swap opens. As always we’ll give you tokens for your items. The only rules are coming with up to 3 items and quality over quantity, something you’re proud to give away. Enjoy some cocktails and food from We Serve Humans. How many items of clothing do you have sitting unworn in your wardrobe? We did a count and had 15 so we’ll be donating them on Wednesday. Tickets can be bought from here otherwise it’s £15 on the door. 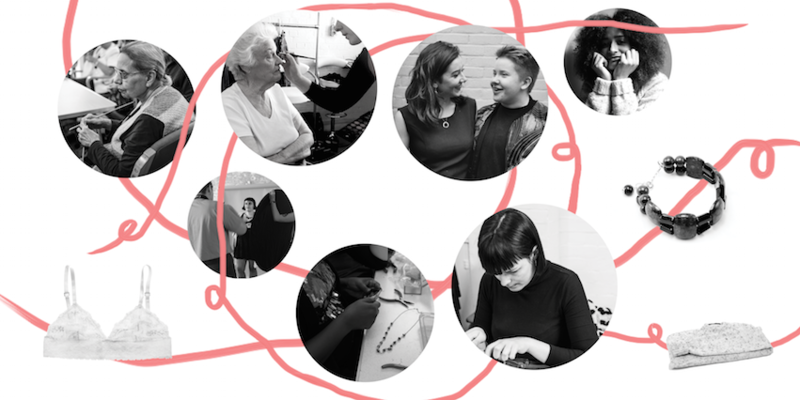 All profit is going to Birdsong, to help Heba who are a women’s group they work with providing a safe space for migrant women to learn sewing skills. 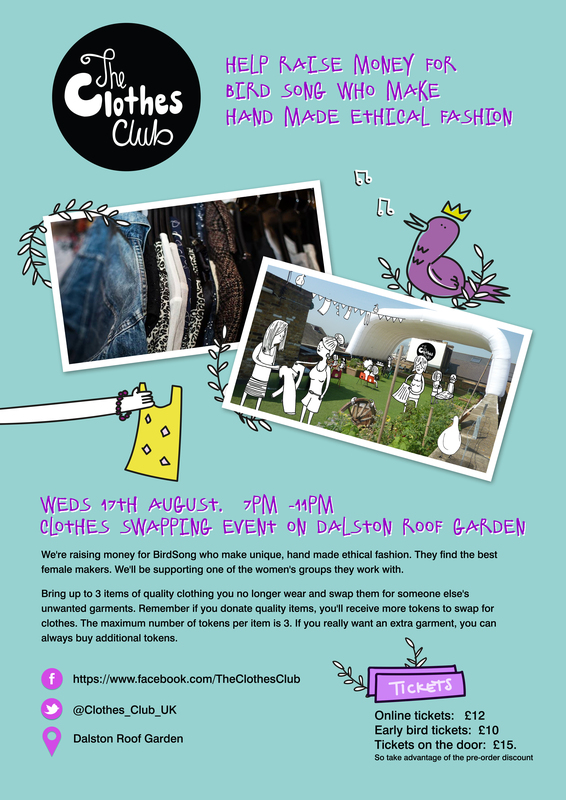 We will be running our next clothes swap on 17th August 2016 at Dalston Roof Park from 6.30pm, more details and tickets are available here. This event will be in aid of Birdsong London but we need your help to decide how these funds are allocated. Birdsong finds the best female makers and brings them to you, no sweatshops, no photoshop. Started in August 2014 by a trio of feminist founders, Birdsong sources fairly made fashion, from chitenge-printed bomber jackets to quirky bone jewellery. Each purchase gives 50-85% back to the women who made it, from groups in Malawi to seamstresses on Brick Lane. The founders saw the effects that funding cuts were having on women’s organisations. Many of these women had incredible crafting skills that weren’t being shown off to the world. Birdsong London decided to source beautifully made clothing from these groups. In doing so they help make over £10,000 for women’s charities annually. Our August event will donate funds to one of these groups and we would like your help to decide which one.